In choosing the best handsaw for your project, there are certain points that you need to consider. First, you need to consider your purpose for using the handsaw and the types of cut you’d be doing. 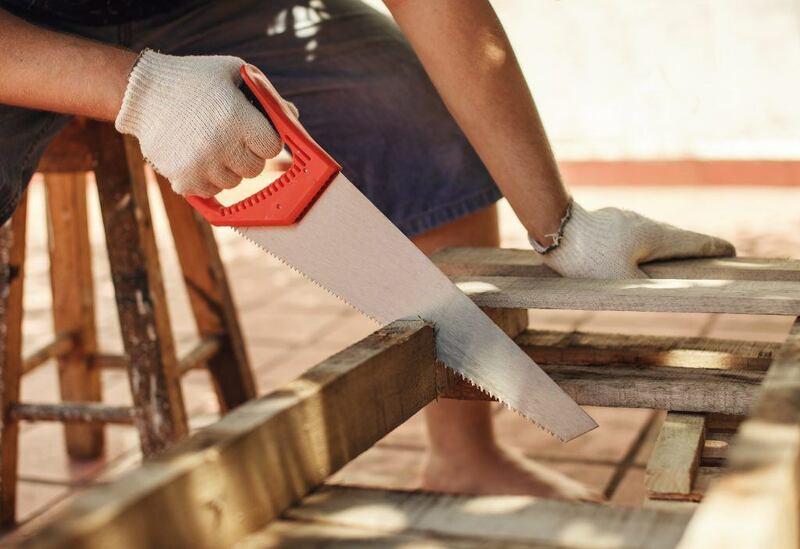 For instance, you may be looking for around saw which is great for virtually any cutting tasks – from DIY maintenance tasks to cutting tree branches and that very familiar carpentry work. 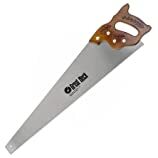 If you’re doing more complicated carpentry and woodworking jobs, then you can opt for hand saws that are more suited for those types of projects like the Crown FLINN1 10-Inch Dovetail Saw. Another thing you must determine is whether you’d be cutting across the grain or whether you’re doing it with the grain. In all these tasks and considerations, there are three basic types of handsaws you can use: rip saw, cross-cutting saw, and dovetail back saw. If you’re going to cut across the wood’s grain, then a crosscut saw is what you need. The cross-cut saw’s teeth are designed as a straight up angle with a beveled edge for crosscutting. The design will enable the hand saw to slice across the grain and sever each fiber cleanly like a sharp knife. If you miss the usual pushing and pulling action, then the crosscut saw is great for you. If you’d be cutting with the wood’s grain, then a ripsaw would be the most appropriate tool for you. Compared to crosscut saws, the ripsaw’s teeth are angled towards the left side and aren’t beveled. Thus, the teeth will bend right and left in an alternate motion, enabling every tooth to serve as chisels that chip out small wooden pieces while sawing with the grain. The rip saw cuts effectively with the push strokes instead of the usual push and pulls strokes like those with the cross-cutting saw. Dovetail back saws are specially designed to work on softwood, hardwood and fine woodworking that require small, precise cuts along with a clean finish. These laws are meant for dovetail joints wherein two pieces of wood fit well. The dovetail contains a smaller blade that’s more compact than the rip or cross-cutting saw for cutting neat straight lines over shorter wood and has higher TPI. What results is a neat finish. This hand saw comes with a cylindrically shaped handle that's freely turntabled in your hands, giving you better control on the cuts you do for your wood. Depending on your project, hand saws may come with traditional panel designs and teeth on the blade’s side, and a d-shaped, straight or 90-degrees handle. The saw may also possess double-sided blades with teeth on the sides, i.e. the Ryoba Double Edge Razor Saw. Different hand saws have different TPI or teeth-per-inch that makes a huge difference in how each cuts through the wood. If you’re looking for a neat trim, use the saw with a high TPI or higher-teeth-per-inch range. When cutting bigger pieces for framing, use a handsaw with lower TPI. Remember that handsaws with lower TPI cut faster and may provide a coarser cut to the wood. The finer the cut, the more teeth you’d need with the blade. The blade’s length determines the hand saw's size. Hand saws with short panels ranging from 12-20 inches are generally used for delicate woodworking since they provide more control. Longer varieties ranging from 24-30 inches are fantastic for general tasks or cabinet-making. The Stanley Fat Max Hand Saw is a stunner in my eyes. It comes with a 9 TPI thick steel blade, along with SharpTooth TM technology, all designed for clean cutting. It enables you to cut several types of plastic and wood and is very efficient at cutting straight cuts with lesser binding. I like, how, with three cutting surfaces, you can cut 50% faster compared with conventional saws. The tool’s sharp “Induction hardened” teeth are five times longer compared to the conventional teeth and have high cutting performance and durability. What I like most about this tool is that it is quite good for quick lumber cutting and it is very sharp for tripping 2-inch tree branches. Gripping the tool is almost effortless, and you can easily control it while working with hardwood because of the handle’s ergonomic rubber grip design which can be held comfortably and reduces slippage. 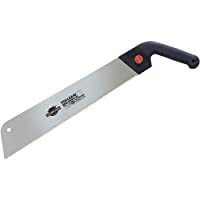 Stanley has become a household and commercial name for 170 years now and whatever kind of woodworking and carpentry task you must do, the Stanley Fat Max Cross Cut Hand Saw is an excellent tool and great value for your money. The Stanley's hand saw is every handyman’s dream. Here’s another hand saw that lives up to its name. With tough high carbonized 26-inch steel blades and 10 TPI (teeth-per-inc), the GreatNeck Cross Cut Hand Saw is a very versatile tool you can utilize for rough, aggressive cuts, along with fine, elaborate cuts, cutting effortlessly through virtually all kinds of wood ranging from hardwood lumber to softwood like maple and red oak to make your woodworking project faster and more efficient. I have great respect for the hand saw’s blade which is very precise, and it has sharpened teeth and great flexibility to provide you with great flexibility and great control cross grain cutting. The GreatNeck is perfect for both outdoor and indoor work because of its weather-resistant hardwood handle that is comfortable to grip. Confident of its quality and efficiency, the GreatNeck covers a lifetime warranty. GreatNeck is a global leader for high-end manufacturing tools since 1919, and they manufacture a crosscut hand saw that you could use for years – the GreatNeck N2610. The GreatNeck is made in the United States and is, therefore, a fantastic choice for a variety of woodworking projects. Next on our list is a double-edged design that can cut through abrasive and hardwood. 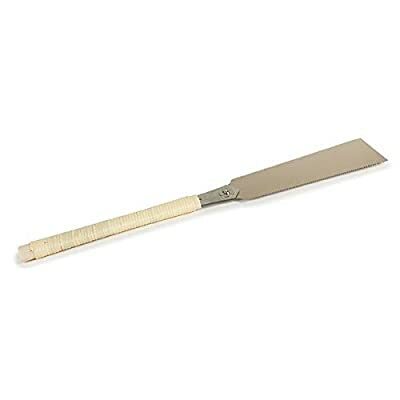 The Ryoba Double Edge Razor Saw cuts through maple, oak, teak, exotic hardwood and other types of hardwood. I admire how this strong and sturdy saw comes with a 24-inch blade with 22 TPI, which more compared to other saws with the same size. And since the teeth are hardened by impulse so they deliver smooth and quality cuts each time you use them. A versatile and high-end saw, the blades contain rip teeth and cross-cutting teeth at the sides, giving them the capacity to cut all kinds of wood easily. It can also make fine cuts, cutting evenly through the grain, making it an excellent saw for detailed furniture projects. The Ryoba hand saw provides you with a lot of woodworking control since the blade can be handled with controlled force, and extra control in the cutting, the wooden handle is trapped with bamboo, making it easy to handle and grip while cutting and pulling. The steel’s blade is interchangeable, and the Ryoba incorporates a brochure the reveals how to acquire the best utility on the hand saw. This gorgeously designed Japanese-style hand saw by Ryoba can cut through abrasive or hardwood like exotic hardwood, teak, oak, and maple, and can be utilized for several woodworking projects because of its double-edged design. It provides great value for your money. I always loved dynamic tools because of their flexibility and the Shark Corp Carpentry Saw is no doubt one of the most dynamic hand saws on the market today. Whether it’s slicing through laminated hardwood or untreated wood, carving through ABS or PVC pipes, or trimming tree roots, this tool has it all. This 12-inch saw comes with a sturdy stainless-steel blade along with 14 TPI, which indicates that it can cut fast and easy through all kinds of wood. It also has a good bend for molding, baseboard trimming, and flush cutting. For better control, the pistol-grip handle gives you a good handle which is crucial while you’re working with sweaty hands on another one of those hot days. The blade is replaceable should it become dull, although you can always sharpen and oil it. The tool will generally last for a very long time. It has a 1-year limited warranty. The Shark Corp Carpentry Saw is a fantastic and dynamic “rip-style” hand saw for virtually all kinds of general trimming and cutting tasks indoors and outdoors. 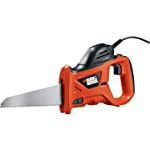 When I first encountered the Black-Decker Handsaw, I thought it was a unique product. This is an easy-to-use electric saw in a carrying case. The hand comes with a 4,600 SMP motor capable of generating 3.4 amps of power. What I like about this saw is that it was designed to be tool free. It can cut plastic, wood, and metal without disruption. The design is lightweight and compact, providing easy storage. The 6 feet long cord provides enough length for indoor and outdoor jobs. Included in the package is a blade that’s applicable for heavy-duty jobs. A cutting blade is also sent with the storage bag to store everything in place. The Black-Decker-PHS550B-Powered-Handsaw has a 2-year warranty. The Black-Decker-PHS550B-Powered-Handsaw is a fantastic saw to keep inside the house these days. 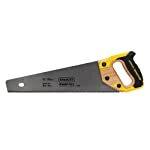 No other saw is quite like the Stanley 20-045 Fat Max Cross Cut Hand Saw. With three cutting surfaces, you can cut 50% faster compared with conventional saws. Not only does it deliver excellent cutting, but it was also designed to cut through several types of plastic and wood and is very efficient at cutting straight cuts with lesser binding. Aside from being the fastest, it is also one of the most precise, with cuts so straight and cleans it leaves very little shredded wood fibers and absolutely no blow-out edges. And beyond this uncanny cutting ability, the Stanley Fat Max Hand Saw is very easy and comfortable to use. We hope you learned from this post. Which among the five best hand saws is your favorite? Feel free to share your choice in the comments. And don’t forget to share this post with your folks.